Spiny-tailed Iguanas are large, bulky lizards with adult males reaching up to 50cm in body length and additional 50 cm in tail length. The coloration of adults can be silver-gray, gray, bluish, or peach, with infusions of red or dark orange. The dorsal surface shows black bands on a greyish or light brown background. Most have black mottling on their backs. The color may also lighten after basking in the sunlight with yellowish and orange markings becoming evident along the sides. Most adults, especially males have black chevrons. Adult males have well developed dorsal crests (up to 15 mm high) and small dewlaps. The dewlap is not inflated. A small bone bows out to extend the dewlap during times of threat, courtship, or while defending territory. Females lack obvious crests. The tails are ringed with rows of sharp, curved spines, hence the name spiny-tailed iguana. Ctenosaura similis can run in a bipedal fashion and are more terrestrial than arboreal. In general they are herbivorous, particularly on legume fruits, but are also known to have a diverse carnivorous diet that consists of small animals. They eat rodents, bats, frogs, small birds (and birds eggs), crustaceans and a variety of insects. Young animals are primarily insectivorous, switching into herbivorous habits as adults. The species becomes sexually mature at around 3 or 4 years. They congregate and mate during specific times of year that varies between populations. 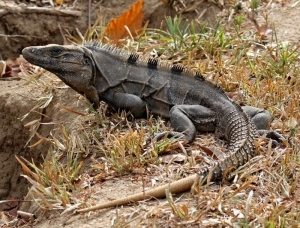 Male iguanas possess a pair of intromittent organs, the hemipenes. When not in use the hemipenes lie adjacent to the cloaca within the base of the tail. During sexual activity one hemipenes is everted by the action of muscles and fills with blood. In copulation, which follows courtship behavior, only a single hemipenis is inserted into the female’s cloaca, and the sperm travel along a groove in the hemipenis. Retraction of the hemipenis is accomplished by drainage of the blood sinuses and activation of retractor muscles that invert the structure as it is withdrawn. The oviparous females then migrate to suitable areas to nest. After a gestation period of app. 40 days they dig a burrow about half a meter deep and lay 2 to 25 eggs. They then defend the burrow for some time to prevent other females from nesting in the same spot. The young iguanas hatch 3 to 4 months later and then take about a week to dig their way out of the nest. If they survive the first difficult years of life, when food is often scarce and predators such as hawks and owls are dangers, they can live more than 60 years.